Published: Nov. 25, 2018 at 02:39 p.m. Published: Nov. 25, 2018 at 02:36 p.m.
Cincinnati Bengals quarterback Andy Dalton rushes for a 21-yard gain. Published: Nov. 18, 2018 at 07:15 p.m.
Cincinnati Bengals wide receiver John Ross Mosses Marlon Humphrey to give Bengals the lead. 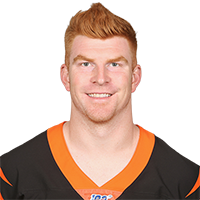 Published: Nov. 18, 2018 at 02:57 p.m.
Cinicannati Bengals quarterback Andy Dalton lasers 4-yard TD to Matt Lengel.